For the chicken and rice: Boil the chicken breast in salted water. Reserve the water, shred the chicken and set it aside. In a pot, add oil, rice and vegetables. Add the water where you cooked the chicken, season with annatto, tomato sauce and a little more salt. Add shredded chicken, mix well with other ingredients and let cook uncovered. Once the liquid has evaporated, cover the pot and lower the heat. Once rice is completely cooked, remove from heat and set aside. For the dough: Combine corn flour, warm water, salt and annatto. Form a ball, separate into portions and roll them out with a rolling pin. Cut the dough into discs with a round cutter or a glass. Add a little of the arroz con pollo in the center of each disc and press down to seal the edges. Fry each empanada in hot oil until they look golden. Line the rolling pin with plastic wrap so the dough doesn’t stick to it when rolling it out. Have left over chicken and rice? You can use it to stuff crunchy empanadas. You’ll love them so much that you’ll make sure you have leftover rice every time. That’s what I try to do whenever we make arroz con pollo or any other mixed rice. 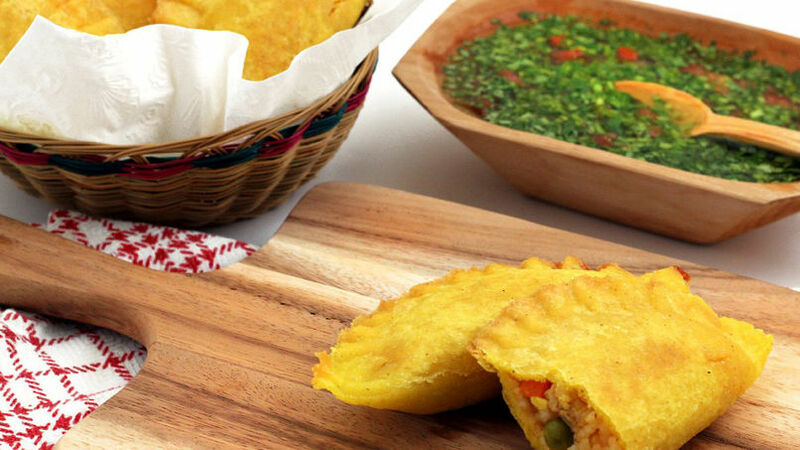 We enjoy it for lunch and then we save the leftovers for stuffing dinner empanadas. We like to serve them with Colombian style pepper and a few lemon wedges. Empanadas are one of my family’s favorite snacks and one of the recipes we always make for parties. Don’t have the recipe for arroz con pollo? Don’t worry, here’s ours.